If you do not read all of those above then you will miss the intent of my blog post. As per Steve Summit, Eric Raymond and Paul Graham, you do not need to focus much on Math to become a brilliant programmer, a hacker, the most decorated word for a programmer (I do not mean Crackers who break into computers and steal private data. Read Wikipedia definition and Eric Raymond’s article on definition of a hacker). Steven Noble says you should learn a little bit of Math and Evan Miller somehow seems to agree with all of them but in a bitter way. I myself started programming just for the love of it. Since 2009, professionally, I am progrmming mostly in C, sometimes in C++ and almost always on Linux and sometimes on UNIX. My passion for programming has made me read and write code in many different languages where I had to learn different ways of thinking. 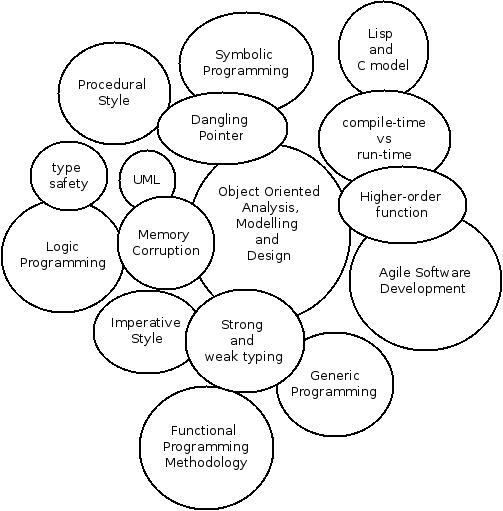 Writing code is easy, thinking along the lines of the paradigm on the top of which a particular language was modeled is a tough, daunting and very time consuming task. I have always tried to do my best and got good amount of experience doing that. I think I am qualified enough to write smo comments about those articles mentioned above. So, let me tell you one thing very clearly: Computer Prgrommaing is not Math. Let me say it again, computer programming is not Math and will never be. You want to learn computer programming, then learn computer prgramming. Do not flip through Math books, read whatever is written on a particular newsgroup (comp.lang.c, comp.lang.lisp for example), read about all the software that came from GNU and use Linux distro exclusively for everday tasks (I prefer a distro with least amount of binary blob). If you are learning lot of Math because you want to learn computer programming then you are confused and headed in the wrong direction and you will not learn much of programming. Except in the speialized fields like 3D game programming etc., you only need Math as much mentioned by Steve Summit. As computer programmers, we write programs, but why ? We write programs to solve problems of this world. That is what computer programmers do, they solve problems. Now what does does a mathematician do ? He tries to understand nature and uses mathematics as a language to do that. Mathematics has helped solved many problems of this world. Look at what Quantum Physics, a branch of physics that has literally changed our millenia old assumptions about atoms, is heavily dependent on Math. Math is everwhere, from chemical industry to societal problems we use Statistics. Take any part of your daily life and you will see how deeply it is influenced my Math. Math has been used as the most prominent vehicle not only to understand nature but also to solve problems of this world. There is a reason for this, all these properties are just inherent in Math. I was not good at Math, so I was trying to solve the problems I was facing everday as a programmer using my intuition, common-sense, flow-charts and more other kinds of diagrams. 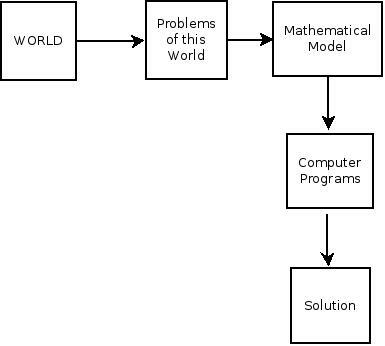 This went on for few years and I came up with some rules and ideas on which I was building a model to solve problems, the problems that I faced everday as a computer programmer. Building up this model had one aim: to be extremely clear and very brief on what the problem is and same for solution. I was creating a model, to which you will feed a problem as input and it will produce a solution as output using English language, flow charts and lot of other kinds of diagrams I created. This model had certain assumptions, rules and conditions, which again were very clear. Clarity and simplicity were high on agenda. It was a kind of a general, abstract mechanism to be applied to problems to get solutions. Now a few months back, after I read all these Math articles I came across one more article from Evan Miller titled Don’t Kill Math which was actually written in response to Kill Math by Bret Victor. These two article hit me very hard. First, Bret was trying to do the same thing I was trying from few years, though he was more successful than me in producing something. I could never come up with some solid model which could have been used by everyone and here is Bret who has already done that. Was I happy, yes, because I found what I was looking for and I was ready to follow Bret’s footsteps but I never did. Why ? There was a reason I could never come up up with a solid model. I always thought it lacked something. No matter what I did and how much I worked on it, I always felt that something very fundamental and basic is lacking. My model lacked a soul, a life can not exist without a soul. Whenver I read Theory of Relativity, whenever I studied Schrodinger equation, Maxwell’s equation, Newton’s laws, Kepler’s laws, The Uncertainty Principle or Shulba-Sutras, I always felt that all those equations are complete, that they have a soul but my model does not. Both of these articles Kill Math and Dont’ Kill Math made me realize what is that soul. It is the properties of Mathematics mentioned in Don’t Kill Math. The questions Evan asked in this article and the way he has explained in very simple and basic details, concluded my search for a model. Math is a terse, short and succinct and the curtest method to solve problems and understand a phenomenon. These brutal characteristics are inherent to Math, just like soul is inherent to every being. With Math you can solve problems in a much shorter and better way than not using it. Try it yourself, read both of Kill Math and Don’t Kill Math and try to solve some problems using both methods. This brings me to a very basic question: Why did I hate math ? If I truly do not like math then I must not like it now too, but instead it is opposite now, I like math. It was the way math was taught to me in school and college. I was taught rote-math, not real math. Same is true for hundreds of thousands of children who pass out of Indian schools. It is not their fault that they can not comprehend and hence hate Math. It is very common statement from Indian parents that “my kid does not know math, my kid hates math”. It is the fault of school, fault of our education system, not of the student. You do not need math to become a first-rate programmer because we do not use much of Math directly. If you want to become programmer then learn programming. Computer programming is very different from mathematics, and as a computer programmer you have to focus more on how to write better programs, how to think in a particular paradigm (e.g functional, OO, Generic, Procedural, logical, declarative etc), find better ways to create software, you need to understand design-patterns, not to mention learning and using C for few years will add new dimension to your thinking. All these are not related to math in anyway. These tools we use to solve problems of this world and they are in no way related to Math e.g look at the different paradigms on which different languages are created, you need to learn these first and it will take you few years before you get a grip at them and then you can learn Math if you want. Read Introduction to Progrmming using Emacs Lisp by Roberrt J. Chassell to know how the problem of creating a customizable, self-documenting, ever-extensible real-time display text-editor was solved. Read GNU Make Manual and find out why does it need M4 and Autoconf. Math is the most widely used vehicle to understand the nature and solve problems of this world. We can learn more ways of solving problems by learning mathematical methods. I myself have started studying probability because like Steve Yegge said, once you understand Math then you can look at the problem and see whether it a probability problem, calculus problem or statistical problem etc. Math is related to the nature of the problem, not nature of software, software has its own methods and tools of solving problems, keep that in mind.